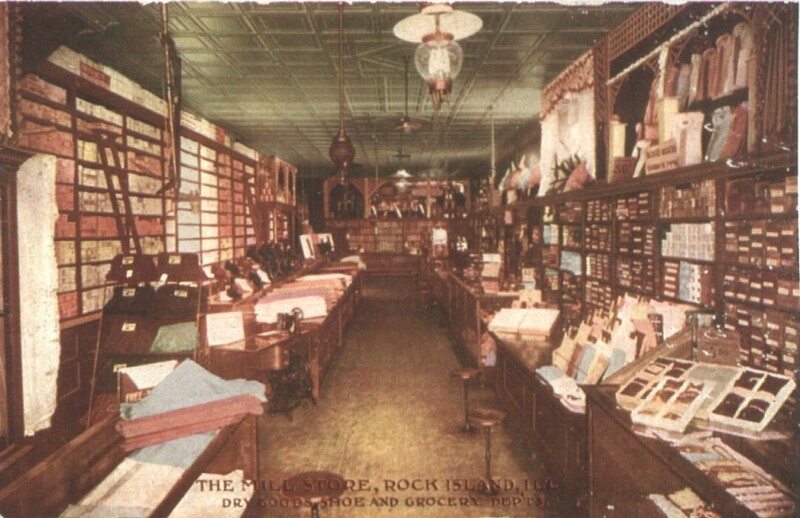 The Mill Store, featured on this postcard, notes that it contains drygoods, shoe, and grocery departments. In city directories, the Mill Store also indicated that it sold hardware here, at its outlet on the southeast of Third Street and Fourth Avenue. All these items and many more were offered in a space that was 25 feet wide and 125 feet long. The Mill Store operated under that name between the 1890s and the 1940s. However it is believed that the business existed even earlier, operating as a Weyerhaeuser and Denkmann company store. The W & D Sawmill was only two blocks away. The 1876 City Directory says that the Mill Store is owned by C. H. Ritter Company and that the name, “Mill Store” was a nickname for the business because it was close to ‘the mills’. Much later in its retail life, the Mill Store evolved into a neighborhood grocery store, eliminating the drygoods, shoes, and hardware. After the grocery business closed in 1944, the building was used for other purposes, from a rug cleaner and auto repair shop, to a heating and air conditioning business. In the 1960s the old store was demolished. Although there isn’t a picture of its exterior, it’s easy to imagine what it looked like. Fire insurance maps show it as a two story frame building with an ice house in back. The upstairs was an apartment usually occupied by the store owner, as was common in the era. The front of the building probably had a gable roof, which may have been enhanced by a more ostentatious false front. Storefront windows would have been as large as practical – not so much for display as for interior light. Although this part of Rock Island is now mostly industrial open space, at one time it was a very real, very interesting neighborhood. As Rock Island grew below the bluffs, industrial, business, and residential uses easily coexisted. As noted earlier, the big sawmill was only two blocks west of the Mill Store. F.C. A. Denkmann’s elegant house was one block west. To the east was Garnsey Square park. The manufacturing plants of Rock Island Stove Company and Rock Island Plow Company were within easy walking distance. There was even a horseradish canning plant nearby. And around it all were homes. But it is the interior of this store as we see it on this postcard that is most intriguing today. Imagine a store, not much larger than the deli department of a modern grocery store, that is able to stock just about everything a family would need. Light from the front windows, and perhaps smaller windows high on the side wall, were supplemented by large oil or gas lights suspended from the embossed tin ceiling. There are small iron and wood stools in front of some of the display cases and counters. Behind the display cases are racks of full shelves. At the upper right, men’s shirts are displayed in an alcove framed by fancy wooden latticework. There is another latticed cupboard on the back wall of the store as well. Shoes are arrayed at the left of the aisle near the center of the postcard. In front of the shoes are what look like bolts of cloth for economical homemakers to sew their family’s garments. Although there is no visible evidence of the groceries, they were probably located at the far back, conveniently near the ice house. And, if the original proprietors used modern marketing techniques, it would have been good for business if patrons walked past the “luxury” dry goods department to get to the “essential” groceries. There is no physical remnant of the Mill Store or even its neighborhood today. But there is a remaining link to this historic era in Rock Island. William Thoms operated the Mill Store with the assistance of his son Raymond between 1903 and 1918. The Mill Store must have provided excellent experience for young Raymond. He went on to help found the homegrown company known as the Thoms-Proestler Company, an enduring business in our community. This article by Diane Oestreich is slightly modified from the original, which appeared in the Rock Island Argus and Moline Dispatch on March 31, 2002.